Stairs provide access to porches, decks, sheds and rooms within a home. Building stairs can be challenging, but it is a relatively straightforward procedure if you have the necessary tools and materials. 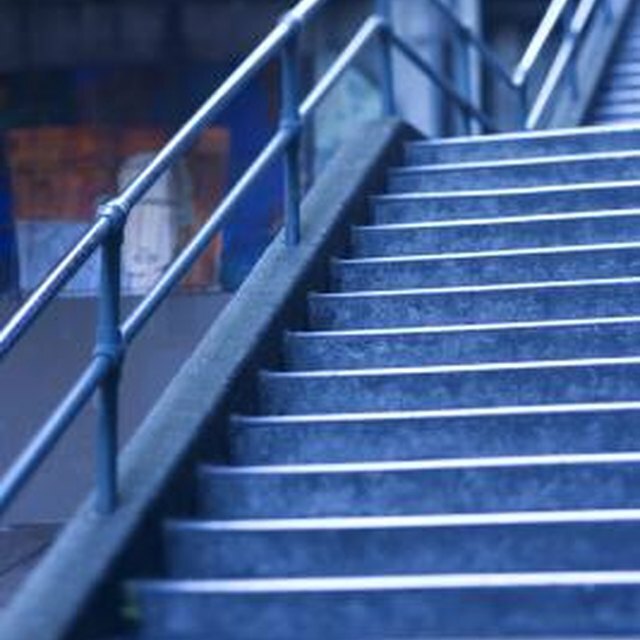 There are three basic components in a set of stairs: stringers, steps or treads and risers. Stringers are the basic foundation of stairs, consisting of sloped boards with notches cut in them to support the steps and risers. Steps form the top surfaces of the stairs, and risers are installed directly under the front lip of each tread to provide a finished look. Once you have stringers intact, you can install steps and risers with moderate ease. Install steps and risers by following a simple procedure. Measure and cut the riser to the length desired using the 16-foot steel measuring tape and circular saw. The riser is attached vertically to the stringer and is underneath the step. Attach the riser to the stringer using three 2 1/2-inch trim head decking screws on each side. Ensure the riser is in the vertical positon before attaching with screws. Continue this procedure for all risers. Measure and cut the steps to the length desired using the 16-foot steel measuring tape and circular saw. The step is the top surface that will be walked on. Leave around 1/8 inch between boards for each step, and screw each one down with the portable drill. Use three 2 1/2--inch trim head decking screws on each step. The trim head decking screws used for the risers are appropriate for the steps too. You can use wood putty to cover the screws to provide a more professional look. Leave 1 ½-inch overhang on the steps to give them a better appearance. Repeat Step 3 and Step 4 until all steps are installed. Stringers can be purchased precut. Always use risers; they protect the exposed end of the wood in the stringer. To give stairs a more professional look, use moulding under the stair lip. Attach the moulding at the top of the riser underneath the step. Wear safety goggles when using power tools to prevent eye injury. Jeannine Lowe is a business technology teacher at McKenzie High School in Tennessee. She has been writing on business and marketing topics since 2007. Lowe obtained her Master of Science in education through Walden University, specializing in integrating technology into the classroom. What Is a Stringer on the Steps?